16 hours, 41 minutes left! Where do I use my Athena Beach Holidays voucher code? Constantinou Bros Hotels have been welcoming holidaymakers to Cyprus for over 25 years and are proud to have been awarded by travel companies worldwide for their high levels of customer satisfaction and exceptional quality, with many guests returning year after year. Athena Beach Holidays offer holidays to a group of these Constantinou Bros Hotels including family holidays, couples holidays, adult only holidays, bowling holidays, dance holidays and Cyprus weddings. There are four different kinds of hotels available at Athena, one of these is the Athena Beach Hotel. This establishment offers a wide range of amenities for couples and families in a superb beachfront location for a marvellous Mediterranean sea holiday. There are multiple dining options available with a choice of five themed restaurants and three bars to keep you entertained as well as three swimming pools and two children’s pools. For adults and couples only, the Athena Royal Beach Hotel and the Pioneer Beach Hotel provide wonderful beachside settings, with modern accommodation and a range of facilities including a health spa with body treatments and beautiful, spacious gardens. For luxury holidays to Paphos, the Asimina Suites is a perfect choice for adults and couples seeking luxury accommodation with spacious and contemporary suites, high levels of service and fine dining in a choice of four restaurants and a luxury spa with a wide range of treatments. With Athena Beach Holidays you can choose your hotel or a flight and hotel option which lets you package your holiday together to save money on your booking. There’s also a great selection of special offers available to help you grab savings too. Athena Beach Holidays offer flight and hotel packages to Cyprus to help you save time and money when booking your getaway. Their flights depart from various airports all around the UK including London Gatwick, Heathrow, Aberdeen, Manchester, Birmingham, Newcastle, Cardiff, Bristol and many more, all of which offer low cost flights and exceptional service. Book your flight and hotel deal with Athena on their website and enjoy loads of great offers and discounts on your package. Simply enter your chosen hotel, airport, departure dates, length of holiday, board basis and number of guests into the search box provided and discover a huge array of luxury flights and holidays to Cyprus, all of which are extremely affordable. If you’re looking for discounts on your holiday you can find tons of deals in the special offers section on the Athena Beach Holidays website. Whether you’re planning on staying at the Athena Beach Hotel, the Athena Royal Beach Hotel, the Pioneer Beach Hotel or the Asimina Suites Hotel, you can find loads of great deals to help save money on your stay. In the special offers section you’ll find free half board upgrades and early booking discounts, so don’t delay and book now for huge savings on Paphos Holidays. Select your flight and hotel stay for any duration from low cost, charter and scheduled airlines, offering huge choice and unrivalled flexibility, and cut the cost of your getaway today. What better place to make your vows than in Paphos, Cyprus- home to Aphrodite the goddess of love. Relax on secluded coves of sand and walk hand in hand along the golden beaches, before, during and after your wedding in one of Athena Beach Holidays’ luxury hotels. Whether you choose a simple service in a traditional town hall, a church wedding, a romantic wedding on the beach or an extravagant ceremony in a Paphos wedding hotel, Athena Beach Holidays will be with you every step of the way. They provide a wide variety of wedding and reception venues, so there is something to cater for all budgets and tastes, from a simple BBQ on the beach to a gourmet fine dining experience, the choice is always yours on your special day. The Athena Beach Holidays’ wedding planners will organise and take care of everything and provide you with experienced local English wedding coordinators who have a vast amount of experience and who’ll advise and tailor all aspects of your wedding day from your wedding venue and wedding cake to your flowers, photography, private transfers, reception venue and reception menus. If you need to cancel your holiday please contact Athena Beach Holidays by email/post to notify them that you will not be travelling on the holiday that you have booked. Cancellations can't be actioned without written confirmation from the lead passenger. Where the cancellation is for a holiday travelling outside of 14 weeks this can be actioned at loss of deposit. Cancellations for bookings travelling within 14 weeks will incur cancellation charges, up to 100%. Please see the terms and conditions for further details. Standard baggage allowance is 15kgs per passenger plus one item of hand luggage that should weigh no more than 5 kgs and easily fits into an overhead locker. However, for further information on your airline's policy please refer to your airlines booking terms and conditions available on your final holiday paperwork. Please note as baggage allowance change periodically it is your responsibility to check with the airline your baggage allowance. Athena Beach Holidays offer a superb selection of holidays to Constantinou Bros Hotels in Paphos, Cyprus. Whether you’re looking for family holidays, couples holidays, dancing holidays, bowling holidays or holidays ideal for weddings then you can find them with Athena Beach Holidays. Discover the Athena Beach Hotel, the Athena Royal Beach Hotel, the Pioneer Beach Hotel and the Asimina Suites for your ideal stay and choose from a huge array of scheduled, low-cost flights from your local airport, giving you the ultimate flexibility. 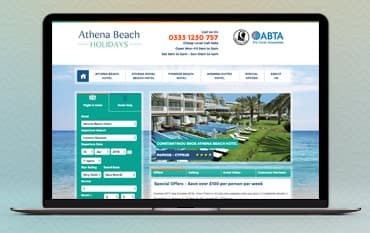 Book online with an Athena Beach Holidays’ voucher code from us and save money on your getaway, you can also browse through the special offers section on the Athena website for the latest discounts and deals. We are constantly on the hunt for Voucher Codes for Athena Beach Holidays to help you with your money saving. Our experts check dozens of sites for secret codes including NHS discounts, student sites & social media channels saving you time & money!